I’ll be a part of the Philly team, and we’ll be headed to a local senior center to hand out crafts and hopefully spread some joy to some elderly people. We’ll be handing out dollar bills and bringing crafts made by some of our kids. I’m really excited to be a part of something so special and hope that by paying it forward we can spread the trend to days beyond just July 14th. 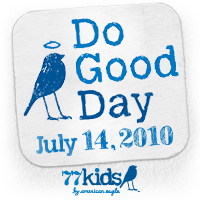 Many thanks to 77kids by American Eagle and the folks at the Motherhood for coordinating and organizing this awesome idea. Check out the Motherhood’s 77kids Do Go Day page to see what other cities are participating – there are 10 other cities so there may be one by you that you could stop by at!